New York City Mayor Michael Bloomberg and Police Commissioner Ray Kelly announced what they are calling the largest gun seizure in New York City history Monday, detailing the arrests of the 19 individuals believed to be responsible for running an illegal gun pipeline from North and South Carolina into New York City along Interstate 95. 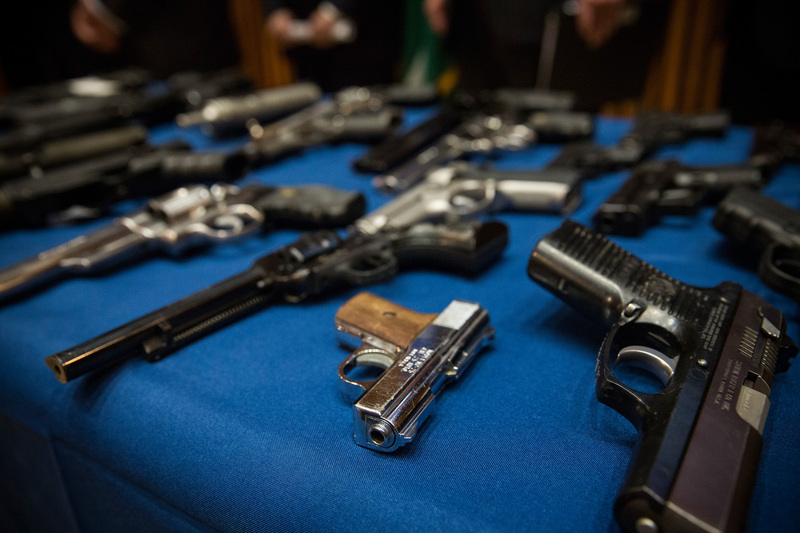 "There is no doubt that the seizure of these guns has saved lives," the mayor said at the press conference. "New York City, I’m happy to say, is the safest big city in the nation. We’re continuing to make our city even safer." The gun bust led to the seizure of 254 guns, including high capacity assault weapons and a fully automatic machine gun. New York magazine published photos of the weapons. Mayor Bloomberg used the opportunity to advocate New York City's controversial stop and frisk tactics — somewhat confusingly, considering stop and frisk played no part in the arrests and gun confiscations. According to Commissioner Kelly, the pipeline was discovered during an unrelated narcotics investigation last year, which led investigators to 26-year-old aspiring rapper Matthew Best, who they in turn linked to 29-year-old Walter Walker of Sanford, South Carolina. According to police, Walker purchased stolen guns in the Carolinas, took them on a bus to New York City, and sold them with the assistance of Best (who, incidentally, recorded songs in a Brooklyn studio in which he boasted of, "packing more guns than the Air Force"). At one point, Walker carried as many as 14 guns with him enroute from North Carolina to New York City, according to police. Yikes. From last September through this July, an undercover agent purchased 116 guns from Walker, most of which were fully loaded, said authorities. Police said they used court-sanctioned wiretaps to monitor the suspects — a.k.a. not stop and frisk. I think generally it’s believed by law enforcement people that without [stop and frisk], the bad guys would feel a lot more comfortable in carrying guns. They carried guns before. They aren’t carrying guns now. Common sense says that if you run a risk of getting stopped, you’re going to pay more attention to what’s in your pocket. Clearly not. Even though one wiretapped conversation revealed one suspect, 23-year-old Earl Campbell, was afraid the NYPD's stop-and-frisk tactics could lead him to be apprehended, that certainly didn't seem to stop the suspects from carrying illegal firearms. Last week, a federal judge ruled that stop-and-frisk, a policy that allows officers to detain and search citizens without a warrant, is a violation of a citizen's constitutional rights. The judge also called for a federally appointed monitor to oversee reforms to the system. Bloomberg is fighting to appeal the ruling, requesting a stay of the judge's order until the appeal is heard. In the gun seizure, Walker, as well as six others, was charged with conspiracy and faces more than 250 counts. Campbell is facing more than 200 counts.